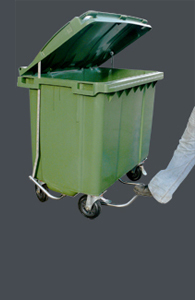 Wrightway Products offers a range of high quality wheelie bins, bins, skips and bin attachments to suit your requirements. 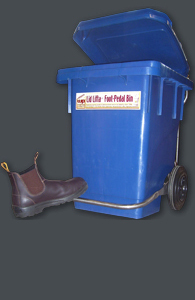 If ibis are a problem, or birds or snakes or rats or any critter that gets into your rubbish, then you might consider the Lid Lifta Bin to KEEP THE LID CLOSED until a person uses the foot pedal to open and close the lid. Spring in the back keeps the lid closed. 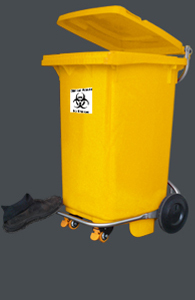 A must in any situation where safe movement of heavy wheelie bins is a priority. 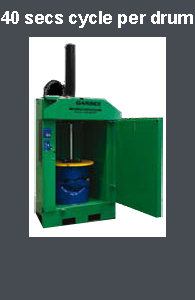 Eliminates damage to base of bins from continual use on non-slip floors. 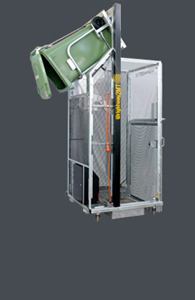 Weight of the contents is carried by the bin, not by the operator. HANDS FREE OPEN AND CLOSE step on container. 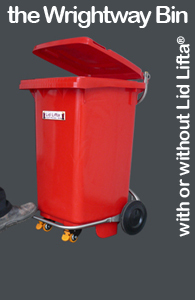 The Lid Lifta® foot pedal allows the operator to bin partially open the wheelie bin lid, or fully open for extended use then close when finished by use of the foot pedal. 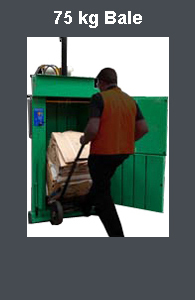 The operator need never touch the lid of the wheelie bin again. 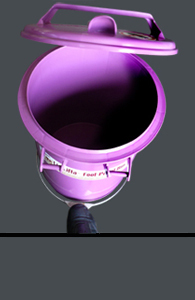 Lid open height can be set to suit specific requirements. 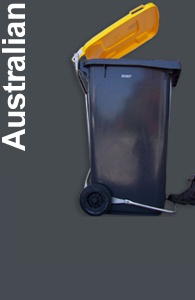 Perfect addition to public recycle bins and recycling stations. 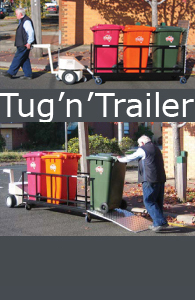 60 Litre, 80 Litre, 120 Litre, 240 Litre Wheelie Bins, 660 Litre and 1100 Litre 4-wheeled bins (skip bins). 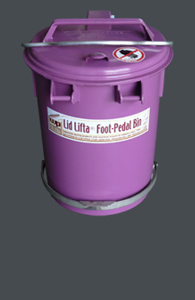 A modified stainless steel foot pedal is available to open and close the lid of round bins (35 litre and 50 litre). Which allows you to ... Keep the lid of the bin closed at all times when the bin is not in use. 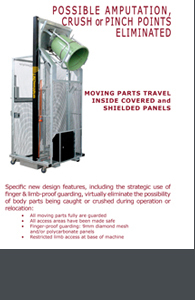 Prevent cross contamination of viral and bacterial pathogens. 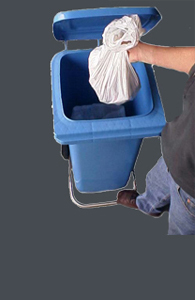 Eliminate hygiene issues associated with touching the lid of a bin in areas where hygiene concerns are paramount. 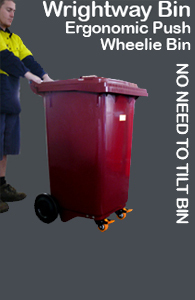 Relocate heavy bins without having to tilt the bin back. 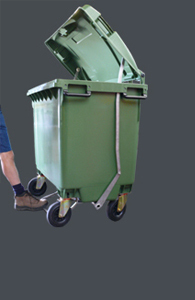 Manoeuvre bins in tight/restricted spaces with ease. All bin colours are subject to availability. Please check to confirm. 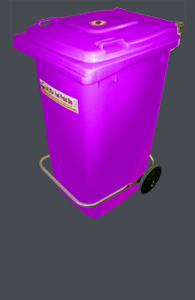 Please Note: We are in process updating all our brochures detailing colours and specifications for bins. The following brochures are a generalised guide only. Please phone to check what you need is available. Thank you. Dark Green, Nature Green,Charcoal (Grey), Black: 80L, 120L, 140L, 240L. Nature Green also available in 360L. Red bins and lids subject to availability. Please check first. Charcoal/Grey ... 1100 body is subject to availability. Charcoal/Grey ... 1100 lids are available. 660 and 1100 Burgandy Lids may be available. Please check before ordering. 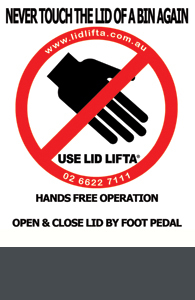 Details: Specific information on the hygienic Lid Lifta® hands-free foot pedal operated bin lid opening device, designed and manufactured by Wrightway Products specifically for use in industrial and commercial settings. The most versatile recycle containers on the market. 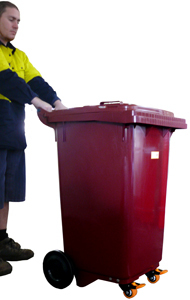 These bins will take your recycle & waste collection system from good to great! 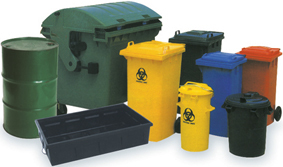 Ideal for office & school collection, containers are designed with a variety of lid and signage options which allow for easy separation of waste streams and the ability to easily expand your recycling program. 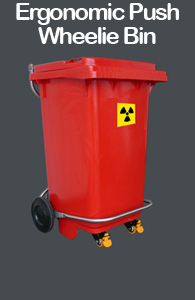 Available in 3 sizes: 60 litre, 66 litre or 72 litre recycling bins. 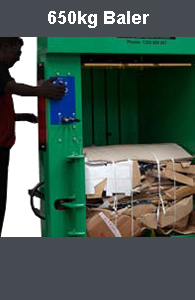 Perfect for your office or school recycling & waste needs! With numerous lid configurations and colours to choose from, the possibilities are endless! 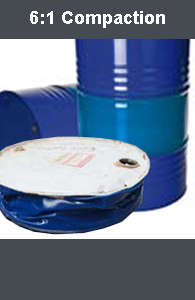 Mix & match openings and lid colours to create the ideal container to suit both your program and surroundings. Available in 2 sizes: 28 Litre & 39 Litre, making this the ultimate solution for both desk side and centralised collection. 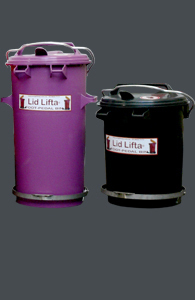 35 litre, 50 litre round bins. 80 litre, 120 litre, 140 litre, 240 litre, 360 litre. 80 litre and 140 litre only. 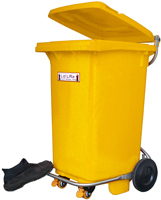 660 and 1100 Litre 4-Wheeled Industrial Bins (Skips). 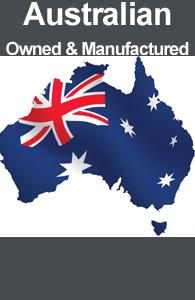 For more information on any of our bins or any of our bin related products, please phone us direct on 02 66 227 111 or complete the obligation-free On-Line Enquiry Form and we will contact you regarding your query within 24 hours.